Simply Pam: Super Fun Birthday Project & Giveaway - Day 2 w/ Edna! Super Fun Birthday Project & Giveaway - Day 2 w/ Edna! Welcome to Day 2 of my Super Fun Birthday Week! Today my guest designer is Edna with Create with Expression. I am on the My Pink Stamper design team with Edna. She is so supportive of my blog and she answers any questions I send her. Especially dealing w/ my Imagine. She's a pro. She is also super sweet! :) She was so nice to agree to help me out this week. I really appreciate it! Here is her card. I love it! It is so bright, cheery and fun! 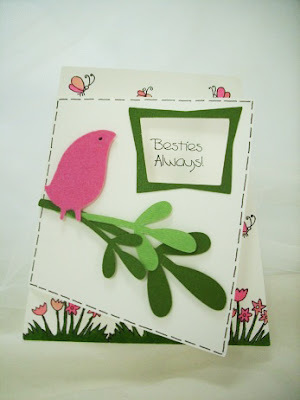 She used the Wild Card Cricut Cartridge and the My Pink Stampers Pink-a-licious stamp set. Make sure you head on over to her blog to see her video on how she made the card as well as see what other projects she has made. She is amazing! BTW, did you see her video yesterday? She was featured on the My Craft Channel! Congrats Edna! You can see her video and post HERE. This is what I call my Making Memories Goodie Packet. There are 8 packages of antique brads, Alphabet Charms, Fabric Pockets, Charmed Frame, Rub On Alphabet and 5x5 red card and envelope. ~ Thanks for stopping by and a BIG THANK YOU TO EDNA! What a fun card, I love the pinks and greens against the white - they pop off the page! Another fab prize...thanks for the chance to win and Happy Birthday!! What a super card. Going have 2 check out her blog 2 C how it's done. Thank U once again 4 this giveaway opportunity. ohhhhh such a wonderful card. Isn't Edna a sweetheart! It is nice to hear that she has been helpful with the imagine cause I might just have some questions for her myself!! Watcher video yesterday and she did an amazing job. Was nice to see her in person and not just her hands!! Her card turned out adorable! what a wonderful card. Edna is great. I love her videos. Amazing lady... I am now a follower of yours. Edna always has fabulous projects! Thanks for sharing with us. 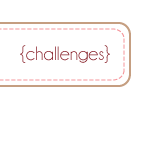 Darling project... I admire Edna's blog too. Thanks for a chance to win Pam. Your card was awesome. What a great card! I've got two new blogs to follow now. Thanks a bunch! You are incredibly generous! What a beautiful card thank you for the giveaway you are very generous!!! Cute card. I do enjoy your blog. Thanks for sharing. I love the card it is so fresh. An elegant card--do you know about the show, The Partridge Family? Happy Day Two celebrating your Bday Pam! Super cute card! Heading over to check out Edna's video now. Thanks for sharing your Birthday week with such fun ideas! Great card. Love the colors. I need to use Wild Card more. 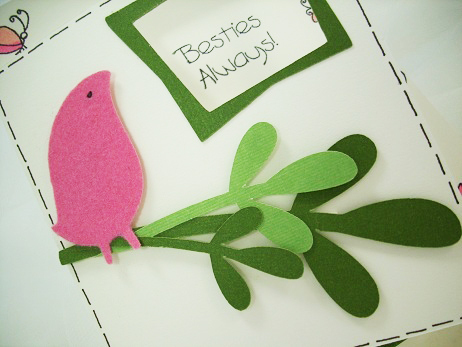 Very cute card, Love the Bird on the Branch!! TFS!! Ohhhh i just love the look of this card. Very Tweet.....tfs!! Pretty card! Love the pinks and greens! I like the colors pink & green together! Great Job. Wow, what a great blog candy. I would be so honored to win it. Thanks for the chance. I have the Wild Card Cartridge and didn't realize that this was on there. To Cute!!! Love the colors, they are so Cheerful! Happy Birthday enjoy your birthday week. What an adorable card she made to showcase. I am heading over there to check out how she made it. What fabulous stuff your giving away, I really love those antique brads. What a fun card. I love your blog. Love Edna's card. Happy Birthday! Love the pink birdie on this one! I'll have to check out Edna's blog, you are blessed with great friends Pam! I love the card Edna made. Love the Wild Card cart too! I hope you feel the same love that you share with all of us, Pam. Have a wonderful week. Love that little birdie!! Thanks for the link to her blog and thanks for the awesome giveaway today. Hope your week is going splendidly!! Fun Funn Fun. I am working backwards, and can't decide which give-a-way I would rather have, they are all great and I would use them all. thanks again. A wonderful birthday celebration. Thanks for the chance at all your giveaways! Happy Birthday!--Pat N.
Love the card, it's so cute.